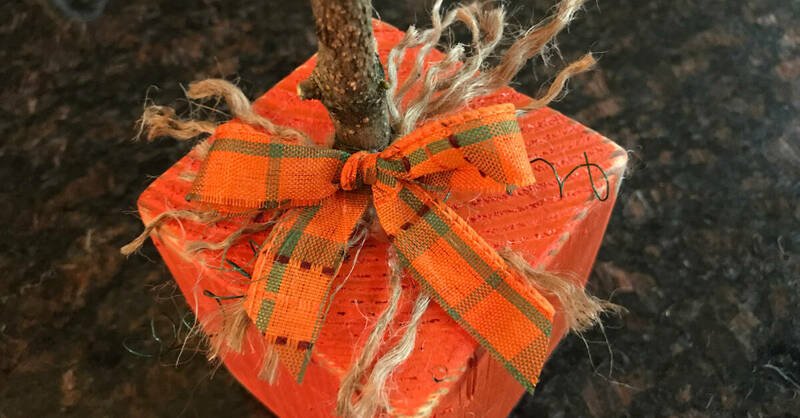 With a new (to us) home and projects galore, I knew I had to have something fun for fall but I also wanted it to be inexpensive. I remembered seeing 4 X 4 pumpkins and was ready to take on the challenge! 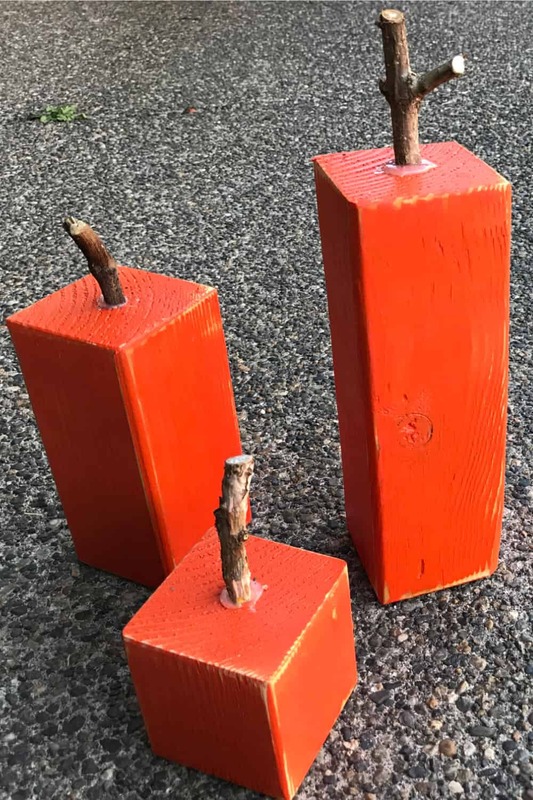 4X4 Wood Crafts are super fun to make! This project was created using little bits of time here and there. We had a table set up in the garage for cutting, sanding, and painting. Once the stem was attached, the operation moved indoors to the kitchen island where I could chat with my husband while creating! We had most of these supplies on hand. If you have to go out and buy a chop saw, this will no longer be a thrifty project, FUN but not thrifty. 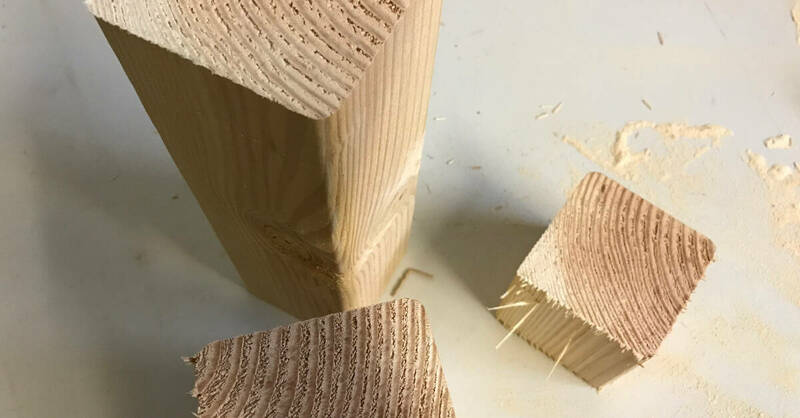 Use a chop saw to cut three different lengths from the 4 X 4. The smallest is squarish and the other two are steps up from that. I didn’t measure. Just eyeballed! Note: I had safety glasses on but should have used a respirator as well. Seriously! Yuck! 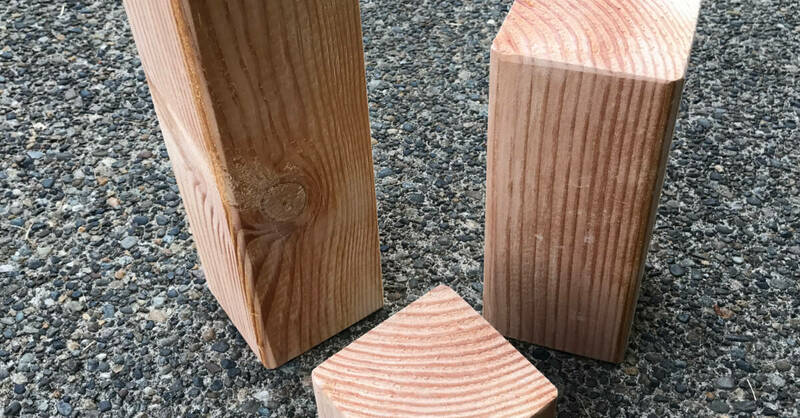 Do a quick sand with a sander or sanding block. My teenagers were quite amused by this point! 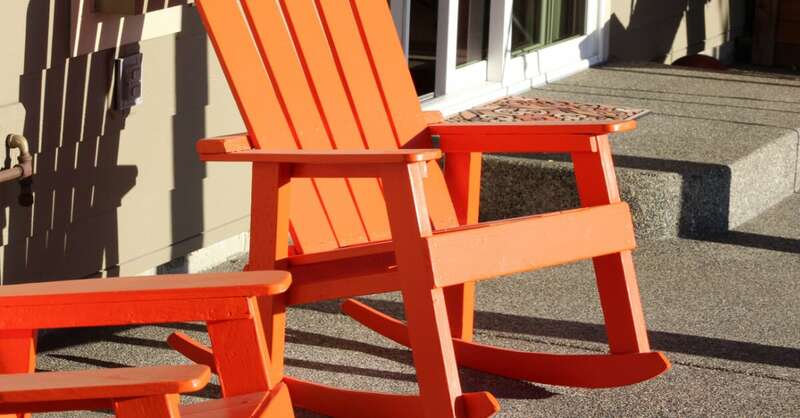 We had orange paint on hand from painting these chairs. Aren’t they fun? Just one coat of paint does the job! I quickly sanded the edges for a worn look. I also sealed the paint with a clear coat of polyurethane. This step probably wasn’t all that necessary but, I had it, so I did it! A few bushes in my yard may have sacrificed a limb to come up with pumpkin stems. Be generous with the glue gun when you attach the stems. The glue will be covered eventually. 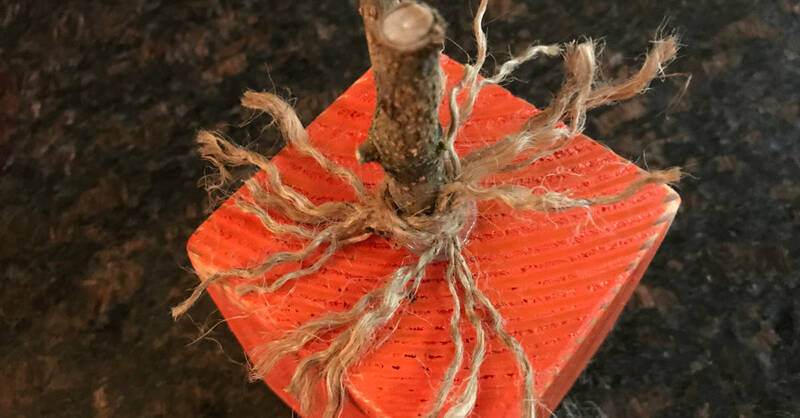 Cut four pieces of jute and tie in groups of two around the pumpkin stem. I didn’t tie too tight to avoid popping the stem off. Well, okay, I accidentally popped the stem off one and had to re-glue. Each jute strand has three larger strands wrapped around each other. I frayed those strands to give it a full look. 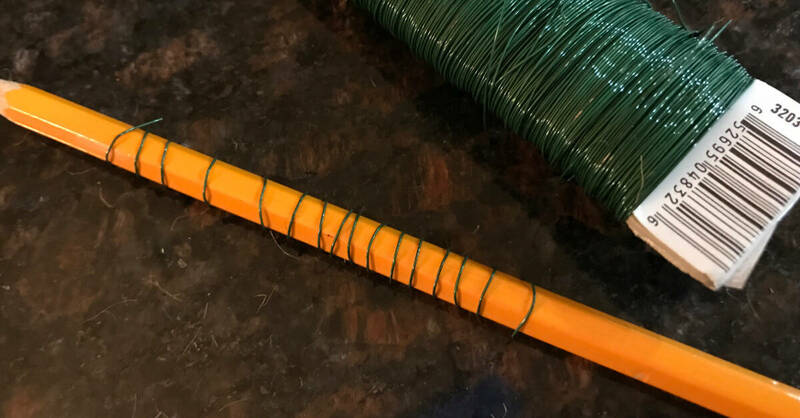 Green florist’s wire wrapped around a pencil works great for pumpkin tendrils. 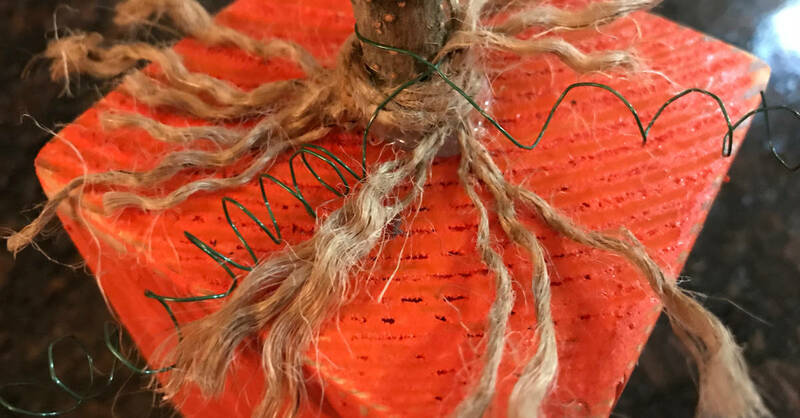 Wrap the curled green wire around the pumpkin stem. Note: If I were to do this again, I would have used thicker wire for a more dramatic affect. 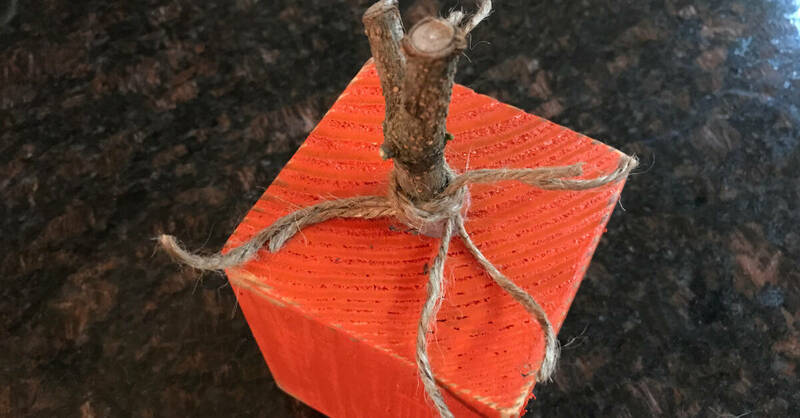 The final step is to tie a bow and hot glue it to the stem! About this time, my son ran upstairs, glanced at the pumpkin and gasped in shock. “It actually DOES look like a pumpkin!” Music to my ears, right there! Are those cute or what? We have three 4 X 4 Pumpkins on our front porch and another grouping of three on our coffee table! About half the 4 X 4 post is still in the garage waiting for another project. 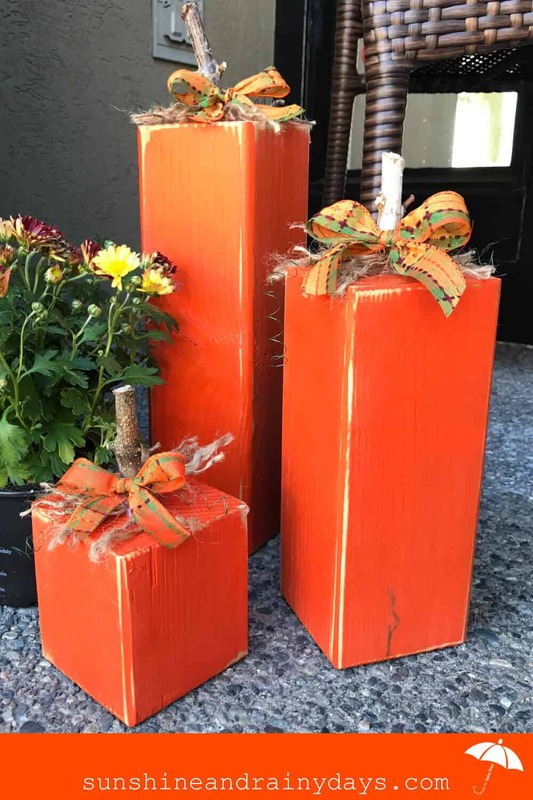 These 4 X 4 Pumpkins ended up being quite the thrifty fall project simply because we had a lot of the supplies on hand! They have brightened our home and porch and satisfied my desire for fall decorations! 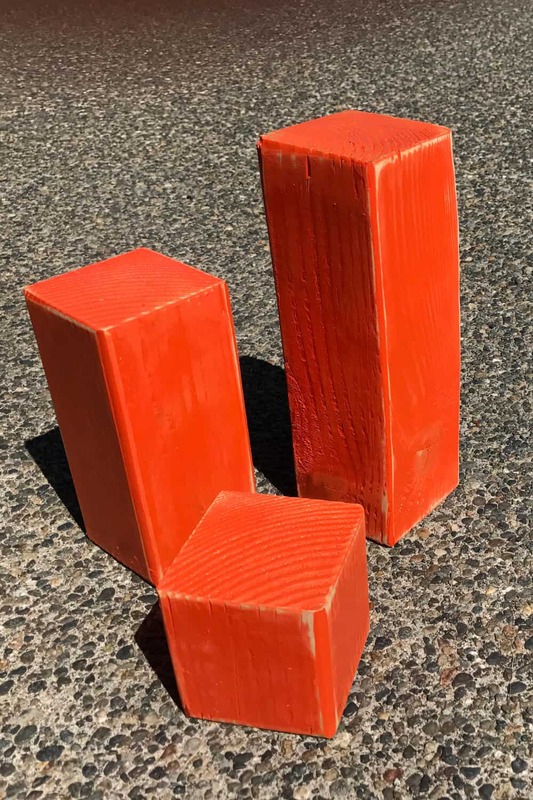 Are 4 X 4 Pumpkins in your future?